Exposure: south / south-east /south-west. Harvesting period: first and second ten days of August. Harvesting: harvesting is accomplished entirely by hand at different times depending on the right ripening period for each grape variety. 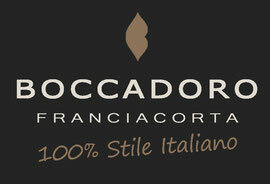 Fermentation: the Boccadoro fine wines are obtained applying a rigorous fermentation protocol. The pinot nero stays in contact with the skins for 12-24 hours in order to extract colour, structure and character typical of the Franciacorta Rosé. Ageing: for a minimum of 25 months on yeasts in stacks in the farm's dark, cool cellars. Colour: shades that go from antique rose to brilliant copper as the wine matures. Aroma: forest fruit aromas mingled with the sensations given off by the yeasts. 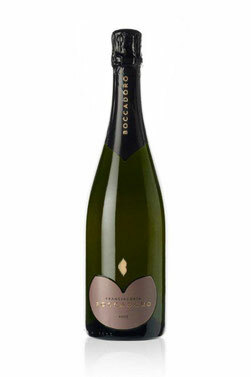 Flavour: hints of ripe fruit, honey and sugar create a generally fine and pervasive sensation. Notes: The wines are the result of work that seeks to preserve the flavour and aroma of the territory. The original taste of the grape is maintained, obtained through the right combination of tradition and technology.